QUICKJET II, this new equipment proposed by MECANUMERIC, is the only one on the market, combining security, compactness, high productivity and ultra precision. Its kinematics, inspired by mechanical milling center solutions (use of ball screws on all axes, very performing AC Brushless servomotors, driven by a user friendly numerical control), allows the realization of high precision parts. Fitted with high pressure pumps and VHP components made by from the water jet worldwide leader KMT, the QUICKJET II equipment is optimized for all industrial precision cutting applications, with pure water jet, of soft materials (rubber, plastic, cardboard, textile, leather, paper, foam…) or with abrasive addition of all hard materials (steel, aluminium, stainless steel, titanium, minerals, glass, ceramics, composites…). Working areas : 1020 x 1260 x 200 mm (XYZ) and maximum size on the table : 1150 x 1350 mm. The running possibility in immersion (the water level varies automatically) offers a great use comfort, a strong noise and projection decrease. Options : dirt processing system and five axes head still allow to increase the productivity. This completely closed equipment, (total housing) is particularly adapted to a full secured use in the school and university field. 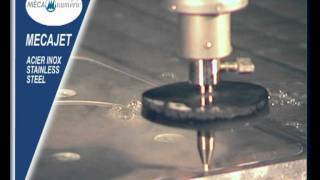 Mecanumeric QUIK JET II waterjet cutting Compact and precision. This new waterjet cutting machine given by MECANUMERIC is unique on the market. It combines safety, compactness, high productivity and ultra precision. His cinematic inspired by solutions for mechanical machining centers (use of ball screws on all axes, high-performance servo-motors AC Brushless controlled by a user-friendly CNC) allows to consider the realization of high precision parts. Equipped with high-pressure pumps and components THP, the QUICKJET II is a water jet cutting machine optimized for all industrial precision cutting applications with pure soft or hard materials. See also other CNC machines of MECANUMERIC: 3 axis cnc mill, 4 axis cnc milling machine - 5 axis cnc mill, cnc laser cutting machine.